Official artwork of a FG II-Graham from Metroid: Other M.
The FG II-Graham (FG II-グラハム, FG II-Graham) is a robotic enemy from the Metroid series. 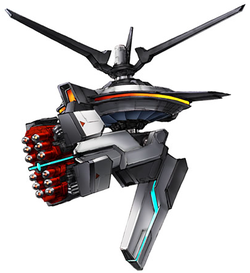 The FG II-Graham has only appeared in Metroid: Other M. It is a robotic sentry guard, with units encountered in pairs throughout the different sectors of the Bottle Ship. They attack Samus Aran primarily by ramming into her or firing beams at her. FG II-Graham units, along with Zeros and Joulions, appear as stage hazards on Pyrosphere. FG II-Graham units fly down towards the stage and then float in the air, suspended by their propellers. If attacked by a fighter, the FG II-Graham is provoked into shooting its lasers straight ahead; this can be used to deal damage to opponents or Ridley. FG II-Graham units do not appear when the stage is set to Ω form. In Metroid: Other M, Samus usually has to face these mobile turrets two at a time. They change speed as they fly around, firing laser beams from their large guns. In the Smash Bros. Pyrosphere stage, they fly in from above and fire lasers straight ahead when attacked. Use those lasers to hit the other fighters and Ridley! In Metroid: Other M, Samus usually has to face these mobile turrets two at a time. They change speed as they fly around, and fire laser beams from their large guns. In this game's Pyrosphere stage, they fly in from above and fire lasers straight ahead when you attack them. Use those lasers to hit the other fighters and Ridley! This page was last edited on December 17, 2018, at 18:08.